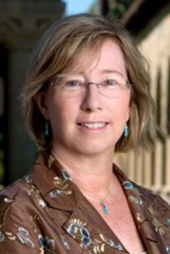 Sally Benson is the co-director of Stanford’s Precourt Institute for Energy and the director of the Global Climate and Energy Project (GCEP). A Professor in the Department of Energy Resources Engineering in the School of Earth, Energy & Environmental Sciences, she studies technologies and pathways to reducing greenhouse gas emissions. Prior to joining GCEP, Benson was a staff scientist in the Earth Sciences Division at Lawrence Berkeley National Laboratory (LBNL). In 2004, she completed a four-year term as Deputy Director of Operations at the lab. Benson also served as Division Director for Earth Sciences and Associate Laboratory Director for Energy Sciences at LBNL.